Sometimes we don’t have the luxury or the time to whip up a masterpiece in the kitchen, so what we do is scour the freezer. I’m not a huge frozen food fan, but the chicken cilantro mini wontons from Trader Joe’s are a staple in my kitchen. They’re crispy. They’re delicious. They’re my go to snack from the freezer (other than ice cream of course). Heat up about 2 tablespoons of oil (I used sesame) in a non stick pan over moderate heat. Let it heat up and then throw in your frozen wontons. Swirl them around for a couple of minutes until you get that nice even crust developing. Water time (or chicken broth). Increase the heat to a medium high and add the liquid of your choice until the wontons are covered about half way. Cover with a lid and let them take a nice steam bath. Takes anywhere between 5-8 min, so keep an eye on them. Remove the lid and start swirling again to evaporate any remaining liquid. This also crisps up the wontons. 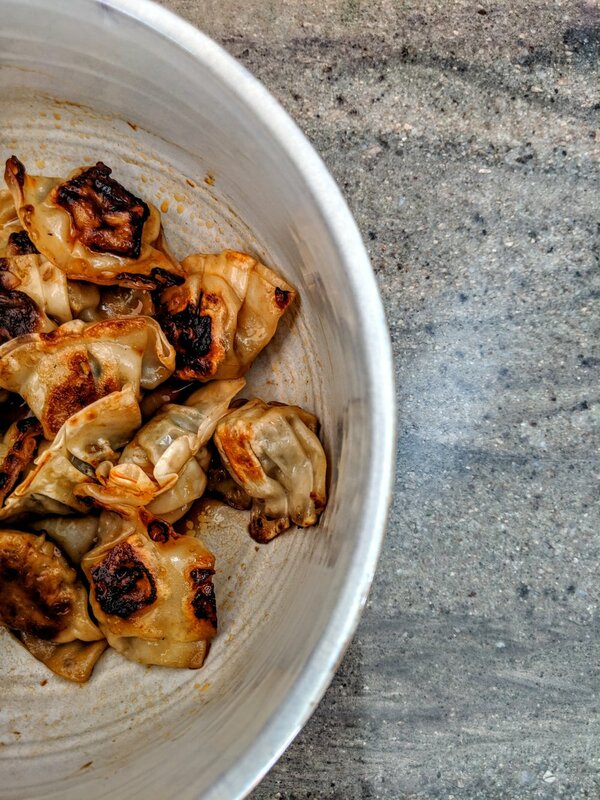 Toss them in a bowl and pour 1/2 tablespoon of Purple Panda chili oil, 1 tablespoon of soy sauce, and 1 tablespoon of Chinkiang vinegar (this stuff is money). Give it a nice mix and sprinkle on some fresh chopped scallions to make it look pretty. Make the whole bag, because you’re going to want more once you’re done. Feel free to mix up the measurements to your liking.